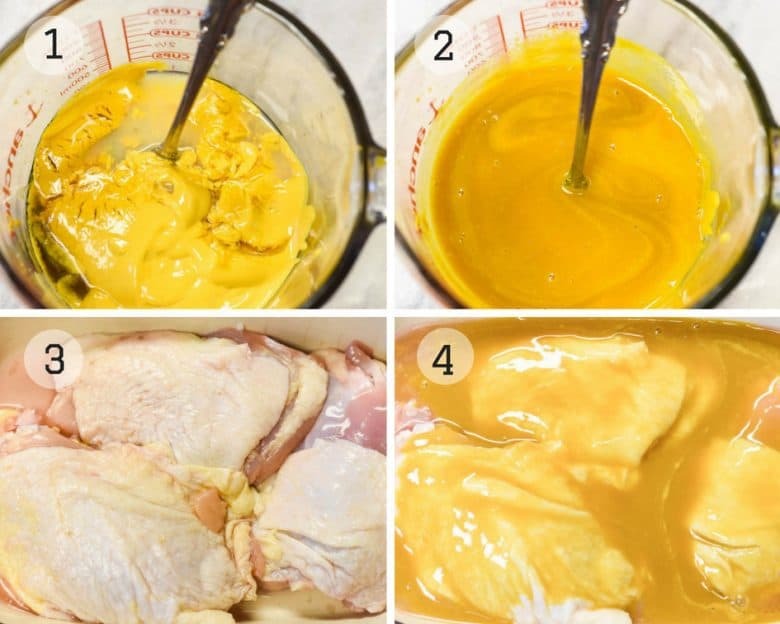 Honey Mustard Chicken recipe is definitely on the menu now that warm weather is here. 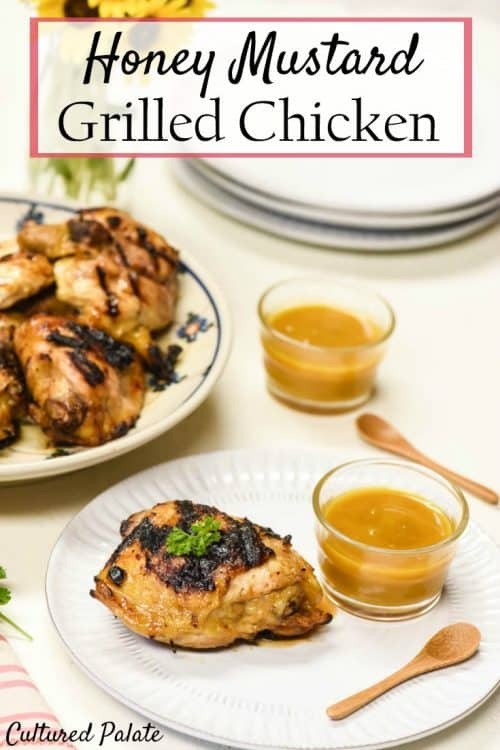 This grilled chicken can also be cooked in a pan indoors and is definitely a must-have for summertime meals and BBQ’s. It is a real food recipe that is GAPS diet legal and Paleo friendly. In an effort to keep the kitchen cool this summer, I have been trying to be creative with grilling. I have never grilled much myself but have found it to be very easy! The following recipe was inspired by my daughter-in-law, Christina who served a grilled chicken dish at one of our dinners at her house. The lemon in the honey mustard marinade gives a slight zing to spice up the flavors a bit. But, don’t worry if you don’t have lemon juice – it is delicious without it! Everyone loved this Honey Mustard Chicken. In fact, the favored part was the crusty skin that had soaked up the marinade – it is delicious! Allow chicken to marinade in refrigerator at least 2 hours. This can also be done in a ziplock bag. Place on grill and cook until desired doneness is reached. 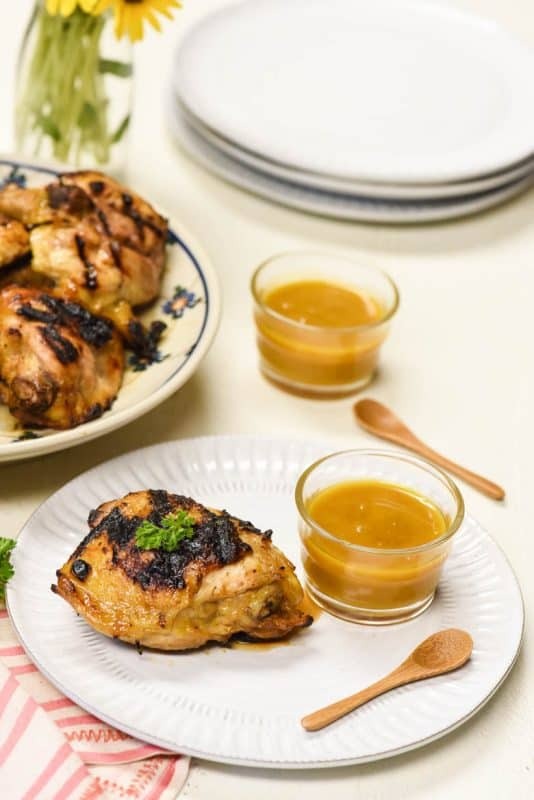 Mix the marinade in a separate container and reserve what is not used (hasn’t touched the raw chicken) as a dipping sauce to serve with the chicken – it is delicious! Chicken can be placed in a ziplock bag and the marinade poured into it, sealed and refrigerated. Don’t peel the skin off the chicken. Not only is it full of healthy fats, it helps make the chicken moist and really is the best part! Marinating overnight helps keep the chicken moist during the grilling. What Can I Serve With Honey Mustard Chicken? If you’ve tried this Honey Mustard Chicken or any other recipe on Cultured Palate please take a minute to rate the recipe and leave a comment letting me know how you liked it. I love hearing from you! You can also FOLLOW ME on PINTEREST, FACEBOOK, INSTAGRAM, YouTube and TWITTER. Don't use storebought marinades - make your own with simple ingredients. Allow chicken to marinade in refrigerator at least 2 hours. Place on grill and cook until desired doneness is reached. I have found that for legs and thighs it is about 5 mins on each side. Mix the marinade in a separate container and reserve what is not used (hasn't touched the raw chicken) as a dipping sauce to serve with the chicken - it is delicious! Don't peel the skin off the chicken. Not only is it full of healthy fats, it helps make the chicken moist and really is the best part! We just love that Honey and Lemon combination, this looks delicious. Your recipe is awesome! Hope you have a great weekend and thanks for sharing with Full Plate Thursday. This is an awesome recipe – great flavors! Thanks for stopping by! 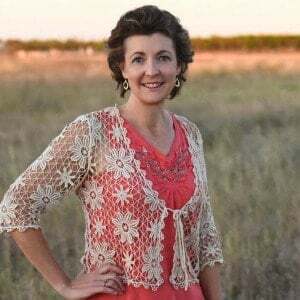 Deb PS I have a friend who also has 10 children – bless you! Chicken is my favorite meal. I need to try this recipe. I can’t wait to start grilling again, this is something I’m excited to try!